The art-deco style embodies freedom and luxury, excluding conservatism. It gave people the opportunity to abandon traditional designs, giving preference to bright and bold ideas. In such a space you will not see the strict forms, the usual color scale, It were replaced by contrasting combinations that unite different details and interior items. Here you can find elements of exoticism, oriental motifs, the luxurious decor of an empire, intricate asymmetry and, of course, classics Design in this style can be any room: bedroom, living room, bathroom, kitchen, office and even the hallway. The art deco style originated in France. After the end of the First World War, the society aspired to global changes in all spheres of activity. This is what influenced the formation of the style. Already in 1920, the French held an international exhibition at which the latest achievements were presented, which served as an impetus for the new direction. The name "art déco" in French means "decorative art". Many features of the style were borrowed from art nouveau, so at the initial stages of art-deco was considered just a variation of it, however more beautiful, modern and luxurious. At that time it was called abstract or jazz modern. Individuality and ease of direction very quickly fell to the taste of exhausted people after heavy war years. Rethinking the classical traditions, the designers formed a full-fledged and filled with new bright ideas art deco style in the interior design, photos of which are direct proof. Creating an art deco in the interior, it must be remembered that in it it is necessary to harmoniously combine objects from different styles. To do this, of course, is not easy, you need to have an impeccable taste and a sense of proportion. The versatility and depth of style are mainly manifested in the combination of various forms. Here you can find strict lines in combination with soft ornate, straight with arched, sharp edges with streamlined. All this gives individuality and creates clear boundaries on which you can determine the style of art deco. Photo-projects of famous designers show by examples how to combine such diversity correctly. Their predominance over the arc-shaped indicates a lack of sensuality and sentimentality. The reason for this was the hard post-war times. In interiors preference is given to sharp and blunt faces, trying to completely eradicate the softness and smoothness of modernity. This solution is typical for art deco style in the interior. It can manifest itself in the design of furniture, architectural structures, decoration, decoration of walls and ceiling. Interesting is the fact that even the interior partitions are trapezoidal. Designers who were honored to work on the art deco style admired the Babylonian constructions. They tried to make the most of the interiors gradualness, showing it not only in the abundance of staircase designs but also in the design of furniture items, in the decoration of fireplaces and other elements. Art deco in the interior is expressed by a complex combination of bright colors. However, it is not recommended to use too saturated colors. It can deprive the space of harmony, turning it into too eccentric. This, in turn, will lead to discomfort. For such premises are ideal for all representatives of warm colors. Terracotta. Light and dark colors harmoniously enter the premises in the style of art deco photo, filling them with comfort, warmth, and comfort. The color is metallic. Feeling of greatness and wealth can be created with the help of gold, silver, bronze shade. It shines will be reflected in the glass elements, which will greatly enhance the effect. White - neutral color, perfectly combined with other representatives of the palette. Widely applying its shades, you can give the interior elegance and softness, balancing the action of bright tones. 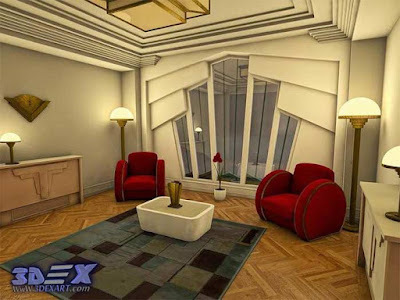 A characteristic combination of regular geometric shapes with streamlined lines is a characteristic feature of art deco style in the interior. First of all, all pieces of furniture should be made of noble wood, covered with a thick layer of varnish. Due to its uncomplicated form, it practically does not need decor. However, the use of mirrors, stained-glass windows, metal fittings will not be superfluous. It is difficult to distinguish the exact purpose of furniture since the art-deco style consists of combinations of all elements of the interior, even the most insignificant. 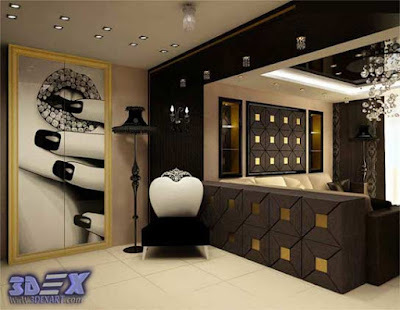 The vast majority of people choosing for a bedroom in the Art Deco style are creative and true lovers of beauty. Art-Deco in translation from French into English means "decorative art", and here the standard situation cannot be dispensed with. To create an Art Deco bedroom, you need to invest your soul, not to be afraid of experiments in decorating, to find that invisible border between modernity and classics, between refined elegance and monumental luxury. Classics and Modern in Art Deco combine, first of all, natural materials, geometric shapes, as well as multifunctionality. For the Art Deco bedroom, the softness of the forms is peculiar, which will be facilitated by a bed with a soft, pretentious headboard, which can have a classic rectangular shape or a modern oval. 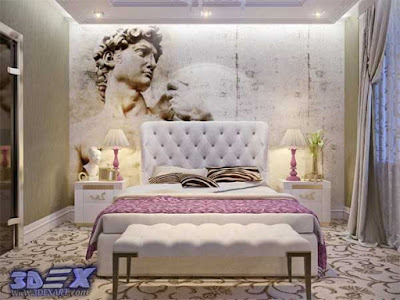 Usually, the headboard is decorated with expensive upholstery or the whole head area is highlighted with relief wallpaper and fabric draperies. Racks, cabinets, bedside tables and other furniture are selected according to this principle: if the walls are dark, then the furniture should be light and vice versa. The presence of an unusual form of the dressing table and puff (or chair) in this style is simply necessary. Mirrors make the bedroom spacious and bright, as well as visually increasing the room because art deco implies a lot of space, light, and cleanliness. 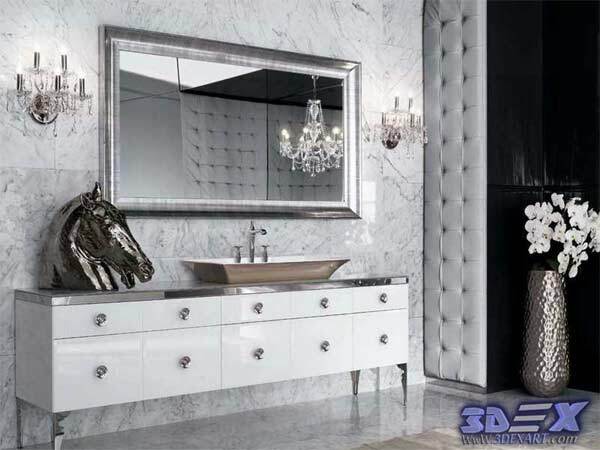 In this regard, there should be a large number of mirrors: cabinet doors, a mirror in the form of sun rays, located in the bedside area, as well as a large mirror at the dressing table. The walls of the Art Deco bedroom can be an ornament of the interior by themselves. Drawings and ornamentation - the main element in the design of the walls of the Art Deco style, as well as all sorts of collages, interior stickers or decorative painting. However, in all the measure is needed. A drawing can be a background frame for furniture or a central accent of the interior, but it must have muted non-boring tones. Art Deco Style also allows the presence of rounded forms: ovals, waves, circles. If there is a niche in the wall, then with the help of a gypsum board it can be shaped like an ellipse and placed there, for example, a dressing table or TV. But in this case, this form must be repeated, or when finishing the ceilings, the floor podium, or doorways. By the way, as for the ceiling, it would not be bad for him to place stucco molding, for example, in the form of a chandelier framing. On walls are allowed to the picture, however, in small quantities, so that the glut of the interior does not happen with different small objects. 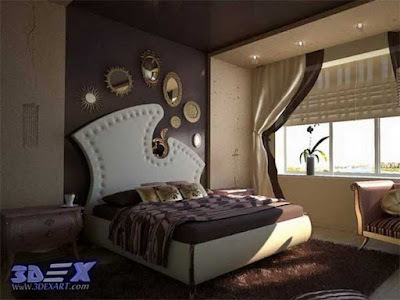 Concerning color - the bedroom in ART Decor style can be made in white, warm-brown, gray, pink, and also red tones. It is recommended to apply contrast. Accessories and furniture should not merge into one, it must stand out. The interiors in the combinations of black and white, chocolate-beige, gray-black, gray-blue and white-burgundy tones look most effective. 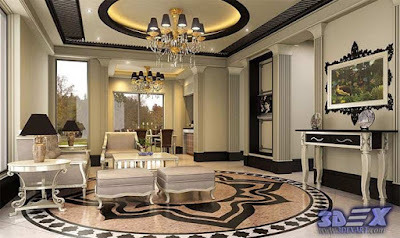 Typically, the interior decoration uses three shades, two of which represent the background (for example, black and white), and one is used as an element of luxury (gold, bronze or silver). It's great if in the decoration as well as in the decor it will be luxury items, for example, silk fabrics, light gilding or parquet flooring. In general, fabric draperies are the main decoration of the bedroom. It gives a special romanticism and coziness. Curtains can be silk or satin, before the bed - the presence of one-color natural skin of white or a bedside rug of artificial fur with a long thick pile. The bed is covered with a luxurious coverlet with pads in the tone of the soft upholstery of the ottoman or chairs. 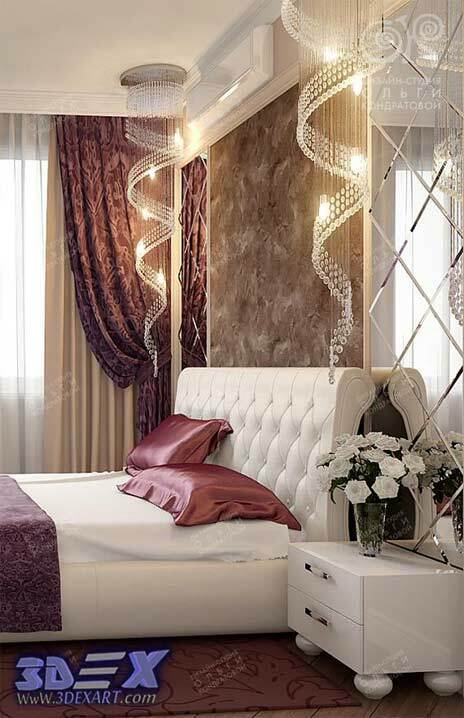 The Art Deco bedroom lighting should be multi-level, at least should be present: a central chandelier made of crystal or multi-colored glass, lamps at the dressing table and floor lamps. For illumination of niches, it is possible to additionally use LED illumination. In modern living rooms in the Art Deco style, geometric figures with rounded facades are harmoniously combined, and furniture usually from valuable species of trees is combined with glass inserts and metal handles. ِArt-Deco Style provides a huge field of activity for the implementation of different ideas. Any drawings can be used, whether it's African ornaments, Cubist designs, aviation objects or design with automotive themes. The interior living room in te Art Deco style consists of a mosaic of styles and eras. As a decorative material used wood of valuable species, leather (including crocodile, shark and sea stingray), semiprecious stones, ivory, bamboo, etc. 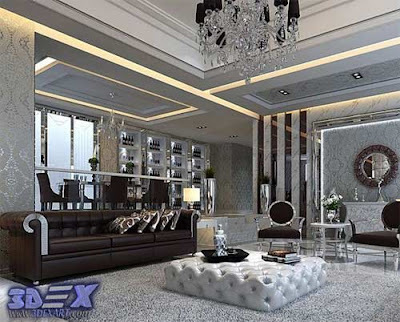 Thus, extravagant materials greatly help to express the whole range of feelings, especially since the living room in the Art Deco style is a real center of aesthetics. Concerning the color scheme - the predominance of dark shades, however, the brown-beige scale is allowed, creating a special nobility of the interior. But as for the variegated flowers - this is unacceptable. The most advantageous effect is played by the monotone saturation in combination with the contrast pattern. Particularly welcome in the living room inlaid glass surfaces, polished to shine metal, as well as polished wood, ok. all these attributes enhance the impression of luxury and nobility. Furniture in the Art Deco living room should also be luxurious, better if it is made by hand from exotic wood species. But in any case, an object is still additionally decorated. The shape of the furniture is also unusual, for example, the seat at the chair can have the shape of a trapezoid, and in the upholstery can be traced Egyptian or oriental ornaments, in short, a combination of the incongruous. Particularly appropriate is the use of chic tables with inlaid countertops, as well as large chairs and armchairs like the royal throne. But we should not forget that the style itself is very elegant and light, in this connection the forms of zigzags, waves or swans necks are actual. The walls of the living room usually serve as a pleasant unobtrusive background for luxurious stylish furniture and other interior items. Very often they are simply painted in a monochromatic color. Although, delicate blotches in the form of ornaments of other colors are also possible. The main thing that must be remembered is that the color scheme for walls and floors should necessarily be soft, but the furniture on its background is dark and even almost black. Also in the interior, there can be everywhere arranged sculptures of female figures, for example, in a dance pose, which is a symbol of purity and grace. Although, the main decoration of this style is still textiles. Curtains used are heavy velvet or satin. Sofa cushions and lamp shades should be matched to the shades. Also, an excellent addition to the interior will be intricate screens or other objects made of wrought iron. Old accessories are used in a large number, such as unique paintings in the spirit of the Middle Ages, as well as various vases and wall clocks, and, of course, chic carpets. By the way, as for the pictures, paintings in the Art Deco style, representing a certain mixture of modern expression with antique elegance with images of female silhouettes, fantastic fairy-tale animals or abstract spots will look great. As mentioned above, the Art Deco style kitchen is a combination of traditional neoclassicism and innovative modernity. How does all this manifest in the interior of the kitchen? First of all, it is originality. Since this style is expensive and bright enough, then the design of the kitchen is no exception, in other words, it will not remain unnoticed. Secondly - exclusivity in the form of unusual antiques, for example, art objects. Concerning the materials used, the following are used: wood (this is the main one), whether polished or inlaid or lacquered, metal (stainless steel and aluminum), natural leather, glass, as well as glossy tile (ceramic, artificial or natural stone) and, of course , textiles (monophonic satin or silk, and also a striped fabric "under the zebra"). In terms of color scheme - an impeccable combination would be black and white (this is the main feature of Art Deco Style). But other combinations of colors are possible, for example, white with chocolate, silver with black, etc. But do not forget that the main range is the colors of metal, earth, stone or natural leather. 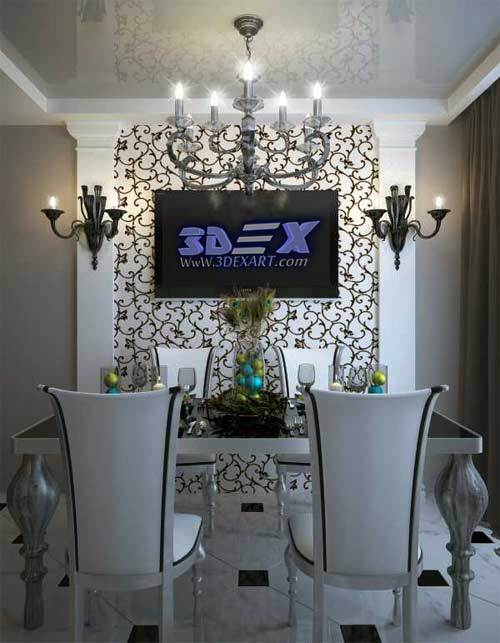 Strips are not bad to apply for decorating the dining area, using non-woven or textile wallpaper of the same texture. A working backsplash can be made of a tile, for example, geometric in accordance with the principle of black and white mosaic. Other colors can also be added, but in small amounts and in muted tones (green, blue, gold and red). Another traditional feature of the style of Art Deco kitchen is the stepped form, which extends both to the patterned decoration of the walls, and to furniture with modules located at different levels, both in height and depth. If the area allows, it would be good to perform a multistage stretch ceiling, if it is tightened with a glossy black or white film and place a lot of lighting. The greatest effect can be achieved if you make one "step" in the form of a molded curb, thus accenting the geometricity inherent in this style. Also, as one of the options - to decorate the Art deco dining area with photo wallpapers in the form of multi-stage images of landscapes, houses or abstractions - if only the drawings contained clear regular geometric shapes. A very significant element and an important touch of Art Deco style is the sun's rays (Sunburst). Rays-bands should be present everywhere: in the upholstery of furniture, decoration, textiles. Striped curtains to the floor, a chandelier in the form of a fan or simulating a zebra skin in a soft corner - one or two elements of "sunlight" will be enough. With regard to furniture, it should be noted that the obligatory condition is to prevent cluttering of space, i.e. furniture should be functional. Upholstery should be made of velvet, satin, leather, and velour. The art deco dining area should ideally be turned into an exquisite table according to the tradition of the best elite restaurants. In general, if we talk about an ideal kitchen in the Art Deco style, then it should contain furniture made from fine wood, made to order, or as an option - restored antiques. 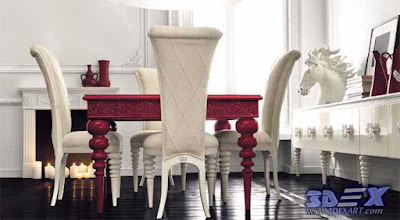 If this is not possible, then there is still an alternative to expensive wood - a two-color lacquered set, which can be black and white, gray-blue, red-gray tones, etc. ), i.e. play on the contrast of colors and varnishing, which also "loves" Art Deco. In addition, you can use furniture, finished with stainless steel. Mirrors in the kitchen also play a huge role. 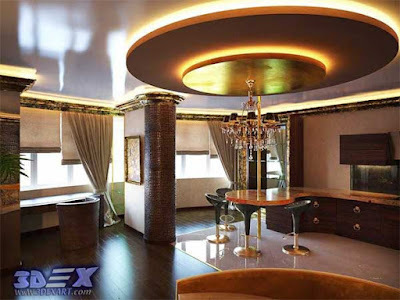 Exquisitely luxurious looks mirror finish the false ceiling, furniture or walls. The only minus - the surface is quickly contaminated. In connection with this, it is better not to place mirrors in the working area of the kitchen. But for the dining area, this mirror finish of the wall is very suitable, especially since it will increase the space of the room in addition to the gloss in the design. In addition, the usual mirror in the form of a trapezium, and even better, in the form of the sun, will look good, especially if you place spotlights for the effect of playing light. Art Deco Kitchen Floors are desirable to be done with lacquered parquet, although, of course, for a kitchen, such a surface is not entirely practical. In this regard, the best alternative - floor tiles (marble or imitation of any other natural stone). You can also use linoleum, which has a geometric pattern. Do not forget about ethnic notes, which should also be present, for example, in the form of paintings with landscapes or black and white photographs placed in thin wooden or metal frames. 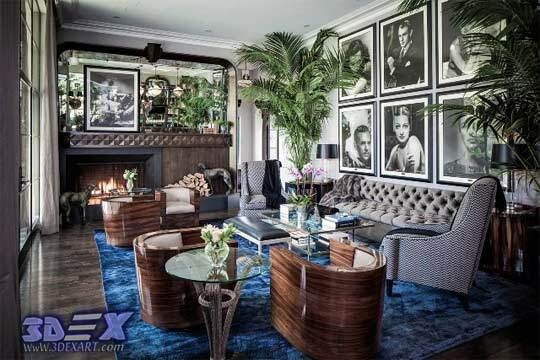 Or decorate the Art-Deco interior with palm trees or exotic flowers. And one more nuance - the fixtures should be enough to ensure a good illumination of the room. And now the most important, so to speak, zest of the Art Deco kitchen - certainly there should be something in it that would immediately attract attention (an exclusive vase, a bronze figurine, silver candlesticks or, for example, a picture). You need to think carefully and choose one of the elements that can cause surprise and delight, whether it is a mirror or a chandelier. Bohemian style of art deco in the interior looks elegant and majestic, all elements indicate the well-being of the owners and their impeccable taste.